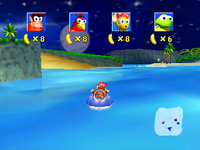 Darkwater Beach is the challenge level found in Sherbet Island in the game Diddy Kong Racing and its remake, Diddy Kong Racing DS. 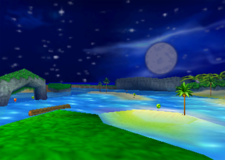 In the Nintendo 64 version, the player can play the battle stage anytime after it is unlocked, but in the DS remake, they can only play it during multiplayer mode. During gameplay, the racer, while riding on the Hovercraft, has to strike down their rivals with items. The setting is on a beach that seemingly has "dark" water. The objective to win is the same to Icicle Pyramid, if the player gets hit four times, they vanish. The last person standing is crowned as the winner. This page was last edited on April 24, 2019, at 01:03.